VICKI SENTAS talks to Agnes Chong and Waleed Kadous from the Australian Muslim Civil Rights Advocacy Network about the impact of the anti-terror laws so far. Since 2002, over 20 pieces of state and federal counter-terrorism laws have been introduced in Australia. These laws created new broad criminal offences, most of which only indirectly relate to violent political acts, and confer unprecedented powers on police and intelligence agencies. Agnes Chong, from the Australian Muslim Civil Rights Advocacy Network (AMCRAN) argues that increased police powers have resulted in systematic government intervention in Muslim people's lives: "The terrorism laws have the effect of constructing Muslims as a suspect community -- just being a Muslim makes you a target of suspicion and subjects Muslim communities, as a whole, to increased surveillance. This has disempowered the Muslim community, with people now afraid to speak out on political issues and even, ironically, the anti-terrorism laws themselves." ASIO and Federal Police raids in 2001, after the [false flag] New York attacks, and in 2002, after the [false flag call to arms] Bali bombings, targeted Muslim homes in Sydney and Melbourne, with no arrests. The New South Wales Council for Civil Liberties reported that 30 raids occurred in 2002, most of them in Sydney, on the basis of innuendo, rumour and conduct taken out of context. 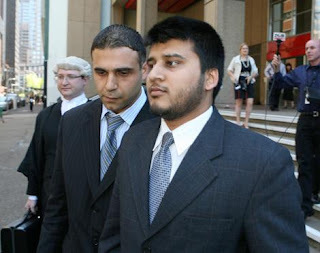 Waleed Kadous from AMCRAN believes the recent ASIO raids conducted against 'suspected terrorists' in Melbourne and Sydney in June 2005 followed a similar pattern: "The ASIO raids yielded no evidence of wrongdoing, despite the broad ranging laws under which preparatory acts can be prosecuted. No one was arrested. Instead, government officials said the purpose of the raids was to 'rattle the cage', and frighten people from the 'next step'. It highlights how ASIO uses its powers to intimidate." AMCRAN is a voluntary community network established in 2004 by Agnes and Waleed. Concerned with the impact of the war on terror on Muslim communities, AMCRAN is dedicated to preventing the erosion of the civil rights of all Australians, and, by drawing on the rich civil rights heritage of the Islamic faith, provides a Muslim perspective in the civil rights arena. Counter-terrorism legislation has been widely criticised as generally eroding civil liberties and democratic freedoms. However the laws have had a specific impact on Muslims. Waleed explains that because the laws define offences so broadly, the only possible way they can be used is through selective application. He describes it as "a back door... for it to be used discriminatorily. Currently, the target of choice is the Muslim community. The list of banned organisations, which is proscribed by the Attorney-General [Philip Ruddock], currently has only self-identified Muslim organisations on it, unlike any other country in the world. Consequently, there are currently some offences that exclusively apply to Muslims." "The laws are so broad that they cover not only the acts commonly understood to be terrorist actions, but legitimate resistance movements. Under the new regime, the African National Congress or Fretelin would be considered terrorist organisations. In the case of Muslims, resistance to the brutal dictatorship in Uzbekhistan, or even financial support to Palestinian families who lost their houses due to the Israeli policy of demolishing homes of suspected -- not convicted -- suicide bombers, would be considered acts of terrorism." This year, federal legislation gave ASIO powers to question and detain people not suspected of committing an offence, for up to seven days. Criminal justice standards such as the right to silence and the right to a lawyer are circumscribed. Disclosing information about the existence of a questioning or detention warrant to anyone, including family, is an offence punishable by five years imprisonment. These 'secrecy provisions' also extend to third parties and the media, making public scrutiny of these exceptional powers not only difficult, but criminal. At the recent Parliamentary Joint Committee reviewing ASIO's new questioning and detention powers, AMCRAN presented evidence that ASIO have threatened people with a detention warrant in order to secure cooperation in informal questioning. "There is evidence to suggest that the powers are being used as a coercive measure in the community, particularly in light of the provision that requires a person's passport to be surrendered when the Director-General [of ASIO] seeks the Attorney-General's consent to request for the issuing of a warrant," says Agnes. While the laws foster differential policing towards Muslims, an anti-Muslim climate is also evident more generally. The Human Rights and Equal Opportunity Commission 2003 report, Isma: Listen documents Arab, Muslim and Sikh Australians experiences of racial vilification and violence since September 11, 2001. The report outlines incidents of social incivility; verbal abuse; threats of violence including stalking and sexual assault; physical assaults such as women having their hijab torn in public places; people being spat upon or more violently assaulted; incidents of arson, vandalism, threats and harassment. Women are reported as overwhelmingly the subject of racist attacks. Particular incidents prompt an intensification of everyday and ongoing forms of racism. During the Gulf War in 1991 and immediately after the September 11 attacks and the October 2002 Bali bombings, a sharp increase in incidents of racial vilification or violence were reported, and remained at an elevated level for some months afterwards. The London bombings resulted in over 300 official reports of racist violence in a three week period in Britain and at least one racially motivated murder of a Pakistani man. In 2004 AMCRAN produced Terrorism Laws: ASIO, the Police and You, a know-your-rights guide outlining the terrorism laws and legal and civil rights. A second edition of the booklet, translated into Arabic, Urdu and Bahasa Indonesia, will be available in October. AMCRAN considers circulating experiences of police interventions and surveillance together with grassroots community education as a key strategy for supporting community responses to the war on terror. "The complexity of the laws leads to fear of engagement in politics and community discussion," explains Agnes. "An important function of the booklet is to let the community see clearly the problems with the laws and why the campaign to change them is so important; while simultaneously showing them that they still have certain rights." Vicki is involved in community-based campaigns against terrorism laws. For more information see AMCRAN.